We understand the Deal with Steel. Come see us at a trade show near you! STRUMIS LTD is excited to be exhibiting at renowned trade shows, events across North America over the coming months. From SDS/2 to SFNE (Steel Fabricators of New England) STRUMIS LTD will be attending these trade shows and events to meet local demand and further develop our brand throughout North America. STRUMIS LTD looks forward to building on significant business potential and numerous ongoing requests. STRUMIS LTD welcomes any delegate registered/attending these trade shows, events and seminars to drop by and see us, where our sales representatives will be demonstrating our solutions for efficient structural steel fabrication management and BIM data management. SDS/2 – User Group Conference – Bronze Sponsor, September 18-20. The SDS/2 Users Group hosts an annual conference. This three-day event is primarily a learning opportunity. Activities include training on very specific topics determined by the Users Group, the unveiling of new enhancements, award presentations and other events. Design Data have offered its partners the opportunity to exhibit during the first two days of its annual Conference. PNSFA 2013 Annual Conference, September 19-21. The annual PNSFA (Pacific Northwest Steel Fabricators Association) Conference encourages the continuing development of the steel industry in the Pacific Northwest, strengthening its infrastructure through the exchange of knowledge and information among its members while also providing exposure to and from specialists in related fields. Striving to keep steel professionals current and proficient as well as progressive in their approach to their industry. SteelDay is an annual event sponsored by the American Institute of Steel Construction and hosted by its members and partners. 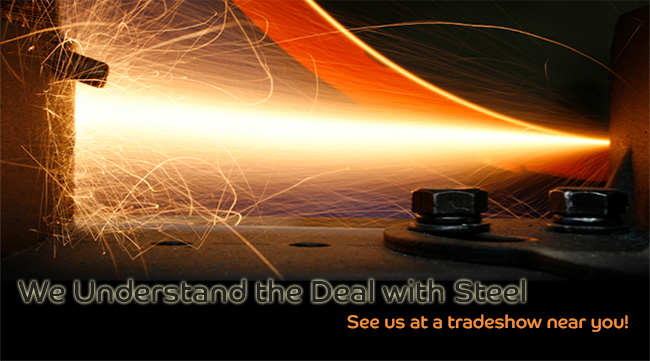 SteelDay is the industry's largest educational and networking function, with events occurring all over the country. STRUMIS LTD's latest fabrication innovations will be on display at the show including the very latest production planning and scheduling feature within STRUMIS. More information can be found at www.SteelDay.org. North America's largest metal forming, fabricating, welding and finishing event. The upcoming event is expected to cover more than 550,000 net square feet and anticipates over 35,000 attendees and 1,500 exhibiting companies. Look out for us on Booth #2059! Our team has direct experience in the structural steelwork industry with two decades of dedicated software experience for the sector. We’re delighted to have the opportunity to showcase STRUMIS – Management Information System for Steelwork Fabricators at these tradeshows. At these events, STRUMIS LTD will also preview the eagerly anticipated Production Planning and Scheduling - allowing users to profitably and effectively manage projects from every aspect. STRUMIS LTD is committed to the further promotion of our range of software products and dedicated services that deliver competitive advantages to the structural steel industry.